Bicycle Racing on a Budget: Closing out the Cross Season. Closing out the Cross Season. Last weekend was the last race of my cross season, a Scottish affair up at Dunbar. I must admit I was pleasantly surprised by the John Muir Winter Carnival and races. Organised by a Triathlon/bike shop from Edinburgh, it covers a whole range of events, running cross, rowing, swimming etc. you get the idea, active stuff. There was a good crowd, enjoying a cool but sunny winter day. The race was an open event, that is everyone thrown into together, with the 2 ront rows being seeded. I didn't expect to get seeded so I lingered around to ensure I was as near the front as I could get, about the thrid row. Ewa had said before the race I should have gone up to the organiser and asked for a gridding, sadly I'm not like that. Says a lot about me really. The course got a little churned up on the hills by the lake. Photos courtesy of Bob Marshall. So 110 or so riders line up and off we go onto what was meant to be a neutral section. In Scotland? Fat chance! Pace was fast and I was about 20th as we hit the flooded lake section, where there was only really one line next to the fence. Into the woods and I was passing riders, past the pits and again I was picking off riders. As you clear the wooded section you hit a sharp left hander and onto the boggy grass and mud. My front wheel slid from under me and I hit the muddy grass. I was up quick and away but lost a place or two. Now that mud was deep and and it was gloopy and it was going to become hard! This was the start of the tough grass section that included obstacles and steps and two run ups. In warm up I managed to ride these, but in the race and grass and mud cutting up it meant running up and freewheeling back down as you snaked up and down the hill.. That was the course and as I started the 2nd lap I was about 10-12th. Now you know when you are racing and something happens so quickly within a fraction of a second and afterwards you realise that you were so close to a having a 'big one', it gives you a shudder? Well I had one. The dry line down the edge of the field and lake narrowed down close to the fence towards the end and there was a large wooden trough sticking out about 10 inches high. I forgot about it. I was sitting on a wheel keeping to the 'good' line when the rider pulled to the right, I flicked my wheel and missed the trough plank by millimetres! Feck! that was too close. Get past and choose your own line! I took out about 5 or 6 riders on that lap and at one point I heard Ewa shout out that I was third? Eh? how did that happen? On the third lap pushing hard and over geared on the wooded climb and I was passed by this guy on a mounatin bike, he was gone man! So the rest of the race was consolidating what I thought was fourth, however by the last 2 laps I could hear the commentator call my name out and I was third. Apparently the mountain biker, Robert Friel was in front but had a mechanical and he re-took second off me. He was riding well and nearly caught the winner Dave Henderson by the finish. Both rode mountain bikes and were a good 2-3 minutes ahead of me in third. Still a podium is a podium and I was quite pleased with myself! It was a good way to close out the winter cross season. 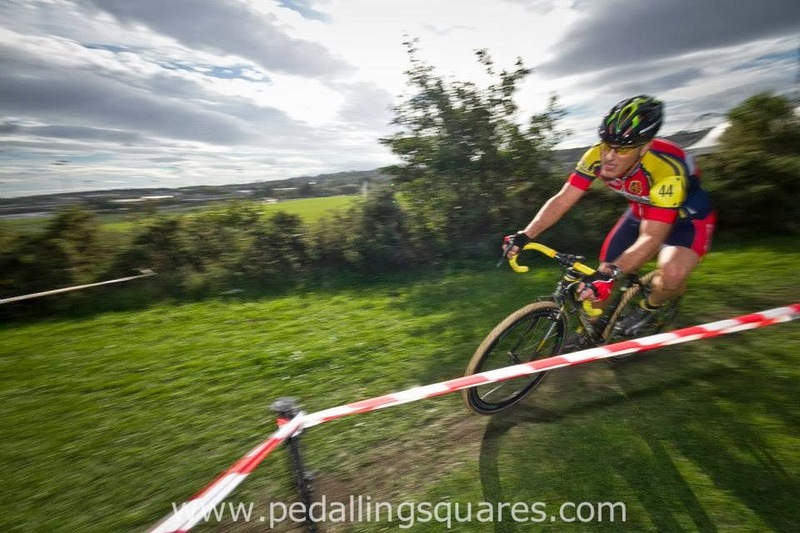 So that was my first cross season after 20 years absence and I have enjoyed it greatly! Fantastic races and enthusiastic support from everyone. A few wins in the NECCL league and winning it overall, and a top 10 in the CXNE vets/juniors league. The CXNE league is extremely competitive and I was astounded by the quality of racing, with over 30 riders regularly finishing on the same lap. The 'hitters' are very strong and are at a very good National standard, with a the likes of Dickie Noble, Tony Glover, and Kenny Johnson, up in the top 20 in the national events. They are a class above me, but then I'm not doing too bad for a fat lad! I managed to be within top 20 in the North of England champs and within a top 40 in the Nationals, 15th in my age group. I've slipped and slided all over the place, huffed and puffed on the running. I've more to come from these old legs and reducing my weight is the key to this. Finally I think the most satisfying feeling that came from the winter cross is how Ewa has become so engrossed in the sport and pitting for me with my spare bike! Frozen and soaked to the skin after some events like Ripley on New Years day but I hasn't dented her enthusiasm! She's even booked up a hotel for next November's World Cup event at Milton Keynes, now that is being eager! And a ,finally, my daughter Zofia, who was being woken up at silly o'clock on Sunday mornings and carted around by dad to races but was so patient, although not getting into the spirit of it (yet)!